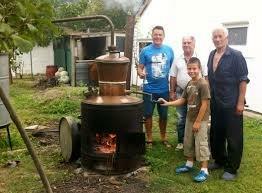 Well, finally the day has arrived for the final process in the making of Rakija, the distilling! 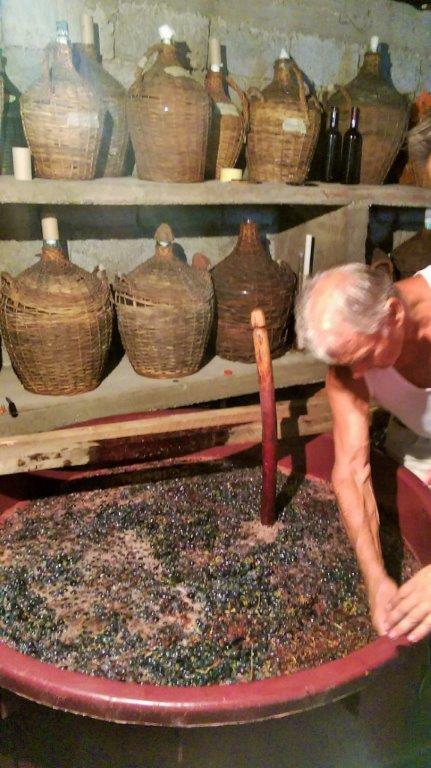 Over the last 3 weeks the barrel of fruit has been stirred every morning and every evening to combine the skins and the juice (and to stop the top from crusting over). It takes experience and a watchful eye to determine exactly when the mixture has finished fermenting, but generally when the mixture has stopped bubbling (some say the mash gets a slight mirror on the surface at this stage). Once the big day arrives, the kettle is assembled in a well ventilated area (for obvious reasons), usually in the yard or under a shed awning. Ample food and drink are gathered to last the group of distillers late into the day (an average harvest will require 4-7 batches with a 120lt kettle). 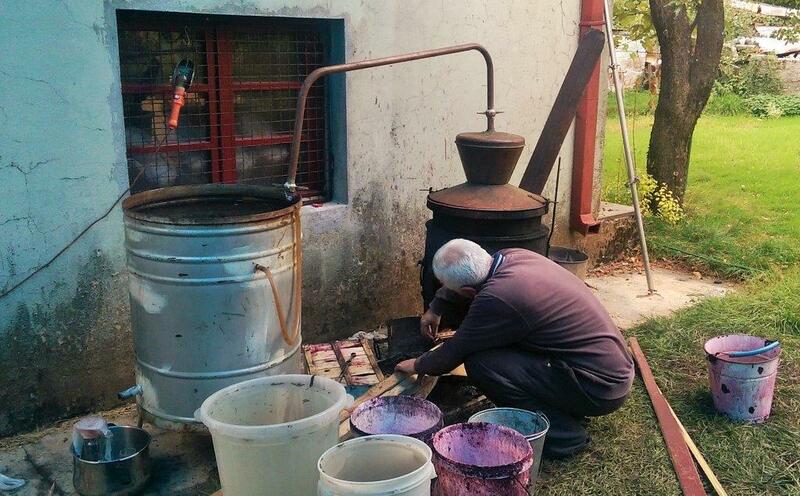 The mixture is added straight to the boiling chamber of the kettle and the top cone (kapak) is put in place. A paste of flour and water is used to completely seal the unit then the pipe to the cooling tank (condenser) is added and the fire is lit. It usually takes 20-30 minutes before the first liquid appears – “the head” (feeling for heat on the pipe to the condenser gives an indication) but this is methyl alcohol and needs to be thrown away or kept separately (some use this as rubbing alcohol). Next comes the first flows of rakija – “the heart” having a very high alcohol concentration. Depending on the size of the still, the heart will continue to flow until the alcohol content starts to drop and more of the liquid vapour is present. This signals it’s time to stop collection as this is the tail. The split between the head, the heart and the tail is most important to get right as collecting too early or too late will result in a poor quality rakija as too much methyl alcohol will “poison” it (think very bad hangover) and too much tail will add unwanted sour flavours. Not enough however will decrease the flavour of the Rakija, it is critical to get this just right! The locals all have their own methods for determining the exact split, methods that have been passed down from father to son for generations. 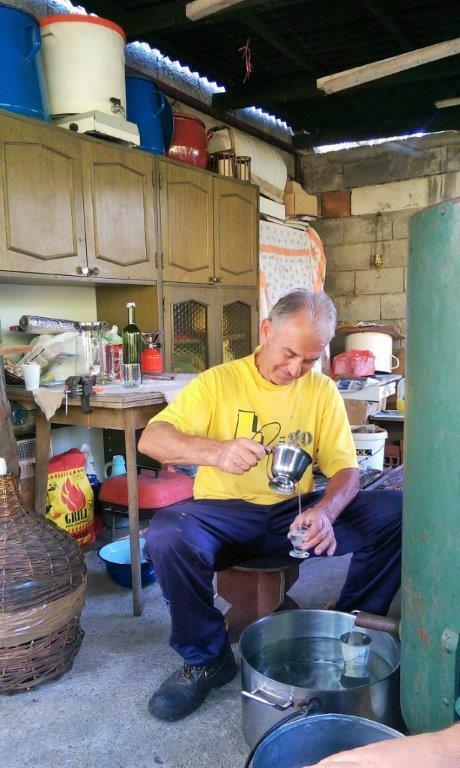 Some use a method of sampling and throwing on the fire, if it flames it’s still the heart but if the flames die then it is into the tail (the liquid will not burn under 30% alcohol), another method is pouring from cup to glass & watching how fast the bubbles disappear. Next is my favourite part, the sampling! Everyone joins in the toast with achorus of“Ziveli”, food is spread out on the table and the feasting begins, the sour sweet smell of fermented grapes hangs in the air, a smell that will forever be etched into my memory of this very special tradition in an amazing country.